кандидат филологических наук, доцент кафедры английского языка № 2 БНТУ Колосова Т.В. Настоящее учебное пособие является частью учебно-методического комплекса по английскому языку. Основу пособия составляют 8 разделов, построенных по единому принципу. Особое внимание отводится изучению специальной терминологии и развитию умений составления реферата. Основная цель пособия—развить навыки устной и письменной речи по специальности. Данное учебное пособие предназначено для студентов второго курса БНТУ по специальности «Строительство мостов и тоннелей», а также для всех, кто стремится совершенствовать навыки общения на английском языке. 1. What is a bridge? How can you describe it? 2. What obstacles are usual to cross? 3. How long can bridges be? Find the following terms and memorize their meaning. Bridgeis a structure used by people and vehicles to cross areas that are obstacles to travel. Engineers build bridges over lakes, rivers, canyons, and busy highways and railroad tracks. Without bridges, people would need boats to cross waterways and would have to travel around such obstacles as canyons and ravines. Bridges range in length from a few feet or meters to several miles or kilometers. A bridge must be strong enough to support its own weight as well as the weight of the people and vehicles that use it. It also must resist natural occurrences, including earthquakes, strong winds, and changes in temperature. Most modern bridges have a concrete, steel, or wood framework and an asphalt or concrete roadway. The roadway is the part of a bridge on which people and vehicles travel. Most bridges are held up by at least two supports set in the ground. The distance between two adjacent sup­ports is called a span of a bridge. The supports at each end of the bridge are called abutments, and the supports that stand between the abutments are called piers. The total length of the bridge is the distance between the abutments. Most short bridges are supported only by abutments and are known as single-span bridges. Bridges that have one or more piers in addition to the abutments are called multi-span bridges. Most long bridges are multi-span bridges. The main span is the longest span of a multi-span bridge. The prototypical bridge is quite simple—two supports holding up a beam—yet the engineering problems that must be overcome even in this simple form are inherent in every bridge: the supports must be strong enough to hold the structure up, and the span between supports must be strong enough to carry the loads. Spans are generally made as short as possible; long spans are justified where good foundations are limited—for example, over estuaries with deep water. A pontoon bridge has no piers or abutments. It is supported by pontoons (flat-bottomed boats) or other portable floats. Some special types of bridges are defined according to their function. An overpass allows one transportation route, such as a highway or railroad line, to cross over another without traffic interference between the two routes. The overpass elevates one route to provide clearance to traffic on the lower level. An aqueduct transports water. Aqueducts have historically been used to supply drinking water to densely populated areas. A viaduct carries a railroad or highway over a land obstruction, such as a valley. All major bridges are built with the public's money. Therefore, bridge design that best serves the public interest has a threefold goal: to be as efficient, as economical, and as elegant as is safely possible. Efficiency is a scientific principle that puts a value on reducing materials while increasing performance. Economy is a social principle that puts value on reducing the costs of construction and maintenance while retaining efficiency. Finally, elegance is a symbolic or visual principle that puts value on the personal expression of the designer without compromising performance or economy. There is little disagreement over what constitutes efficiency and economy, but the definition of elegance has always been controversial. Modern designers have written about elegance or aesthetics since the early 19th century, beginning with the Scottish engineer Thomas Telford. Bridges ultimately belong to the general public, which is the final arbiter of this issue, but in general there are three positions taken by professionals. The first principle holds that the structure of a bridge is the province of the engineer and that beauty is achieved only by architecture. The second idea insists that bridges making the most efficient possible use of materials are by definition beautiful. The third case holds that architecture is not needed but that engineers must think about how to make the structure beautiful. This last principle recognizes the fact that engineers have many possible choices of roughly equal efficiency and economy and can therefore express their own aesthetic ideas without adding significantly to materials or cost. 1. Bridgeis a structure used by people and vehicles to facilitate traveling. 2. To build a long bridge is very difficult and expensive, so a majority of bridges nowadays don’t range in length more than some hundred meters. 3. Single-span bridges are supported only by two abutments. 4. The main span in the multi-span bridge is the shortest one carrying the main load. 5. Aqueducts were used to provide people with drinking water. 6. Efficiency of a bridge is a scientific principle that takes into account the quantity of people and vehicles passing along the bridge. 7. The definition of elegance is not disputable. 1. What is a purpose of a bridge? 2. What is the difference between abutments and piers? 3. Why are spans made as short as possible? 4. What types of bridges according to their function can you name? 5. What do you know about a threefold goal of bridge design? 6. Describe three positions in bridge building taken by professionals. III.What definition of a bridge is correct? 1. a way with a prepared surface, for vehicles, pedestrians, etc. 2. place for crossing a street, water etc. 3. a structure providing a way across a river, road, railway, etc. 4. underground passage dug through a hill or under a road, river, etc. 7. The road goes … the old railway bridge. 8. The new bridge will … the Thames at this point. 9. Can you see that pontoon bridge … the river? 11. The types of the bridge are …, …, … . 12. … means reducing the costs of construction and maintenance. Bridges have always been used by people. They have to be strong and long enough. They also must withstand the action or effect of natural occurrences. Most bridges are held up by supports at each end of the bridge set in the ground. Some bridges have also the sup­ports that stand between the abutments. We can say that there are bridges supported only by abutments (most short bridges) and bridges having one or more piers in addition to the abutments (the longest span of such bridges can be quite long). There is also a bridge with no piers or abutments. While building a bridge engineers discuss the principle that puts a value on reducing materials and the principle that puts value on reducing the costs of construction and maintenance. The principle that puts value on the personal expression of the designer is indisputable. VII. Write key words of the text so that you can give the main information about bridges. 1. How long have people use such a structure as bridge? 2. What materials served as first bridges? Logs or vines that extended across streams probably served as the first bridges. From this at a later stage, a bridge on a very simple bracket or cantilever principle was evolved. Timber beams were embedded into the banks on each side of the river with their ends extending over the water. These made simple supports for a central beam reaching across from one bracket to the other. Bridges of this type are still used in Japan, and in India. A simple bridge on the suspension principle was made by early man by means of ropes, and is still used in countries such as Tibet. Two parallel ropes suspended from rocks or trees on each bank of the river, with a platform of woven mats laid across them made a secure crossing. Further ropes as handrails were added. When the Spaniards reached South America, they found that the Incas of Peru used suspension bridges made of six strong cables, four of which supported a platform and two served as rails. The first bridge known to historians was an arch bridge built in Babylon about 2200 B.C. The ancient Chinese, Egyptians, Greeks, and Romans also built arch bridges, using bricks and stone as building materials. During the Middle Ages, moveable bridges called drawbridges were built across the moats of many cas­tles in Europe. Truss bridges were developed in the 1500’s. Most bridges were made of stone or wood until the late 1700's, when cast iron and wrought iron were first used for bridges. Many suspension bridges that hung from wrought iron chains were built in the early 1800's. Between 1830 and 1880, as railroad building expanded throughout the world, bridge design and construction were aimed to carry these heavy vehicles over new obstacles. Designers experimented with a wide variety of bridge types and had to meet the demand for greater heights, spans, and strength. Locomotives were heavier and moved faster than anything requiring stronger bridges. The basic beam bridge was strengthened by adding support piers underneath and by reinforcing the structure with elaborate scaffolding called a truss. During the period of railroad expansion iron trusses replaced stone arches as the preferred design large bridges. The first plate girder bridge was completed in 1847, and the modern cantilever bridge was introduced about 1870. In the late 1800s, steel became the chief material used in bridge construction. In 1855 British inventor Sir Henry Bessemer developed a practical process for converting cast iron into steel. This process increased the availability of steel and lowered production costs considerably. The strength and lightness of steel revolutionized bridge building. In the late 19th century and the first half of the 20th century, many large-scale steel suspension bridges were constructed over major waterways in the late 19th century, engineers began to experiment with concrete reinforced with steel bars for added strength. More recently, reinforced concrete has been combined with steel girders, which are solid beams that extend across a span. When the Interstate Highway System in the United States and similar road systems in other countries were constructed in the mid- to late 20th century, the steel-and-concrete girder bridge was one of the most commonly used bridge designs. The last three decades of the 20th century saw a period of large-scale bridge building in Europe and Asia. Current research focuses on using computers, instrumentation, automation, and new materials to improve bridge design, construction, and maintenance. I. What can it be? 1. Logs or vines across streams served as the first bridges. 2. A bridge on the suspension principle was made by people in the Middle Ages by means of handrails. 3. The Incas of Peru used beam bridges made of six strong cables. 3. An arch bridge is known to be the first bridge. 4. Another name for a drawbridge is a cantilever bridge. 5. Designers of the 19th century had to meet the demand for greater heights, spans, and strength. 6. Railroads expansion made iron trusses be replaced by stone arches. 7. Since late 1800s reinforced concrete has been chiefly used in bridge construction. 8. A steel-and-concrete girder bridge was one of the most commonly used bridge designs in the 20th century. 1. What are the earliest types of bridges? 2. 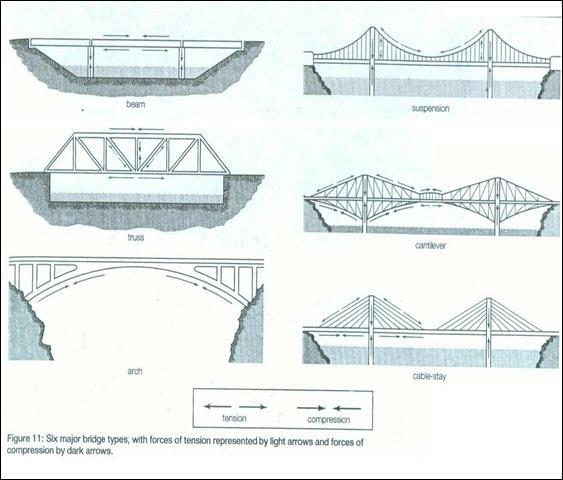 What periods in bridge construction can you distinguish? 3. What is the principle of a suspension bridge? 4. How can you explain the fact that drawbridges were mainly built in the Middle Ages? 5. What was the reason of adding additional support to a basic beam bridge in the 19th century? 6. What was Sir Henry Bessemer famous for? In what way did his invention develop bridge construction? 7. When did large-scale bridge building start? What are the reasons? 8. What does current research focus on? 2. a structure providing a way across a river, road, railway, etc. 3. iron or steel beam or compound structure for bridge-building etc. 4. hinged retractable bridge, esp. over a moat. 1. What civilizations can you recollect as the ancient world? 2. What materials were the first to be used in bridge construction? 3. What were the first types or kinds of bridges? 1. The first bridges were upheld by arches, such as flat stones or tree trunks laid across a stream. 2. Materials to construct first bridges were available and ample. 3. Clapper bridges were built with long slabs of stone and with rocks or blocklike piles of stones. 4. Bridge construction work in the Roman Empire was done by slaves, soldiers, or natives, so labour costs were few. 5. Circular arch form used by the Romans served to make spans much longer than stone beams. 6. The Romans developed the cofferdam allowing piers to be built on rocks. 7. Crisscrossing of the logs helped to reach adjacent piers. 8. Old boats filled with stones were used as cofferdam-like foundations. 1. What are the main types of bridges in the ancient world? 2. What was the principle of a simple beam bridge? 3. What is a clapper bridge? 4. The Romans developed bridge construction. In what way? 5. What was the purpose of the cofferdam? The construction of what type of bridges requires the cofferdam? 6. What is the basic design of a cantilever bridge in the Ancient Asia? 1. What kinds of bridges were in the Ancient World? 2. What are the purposes of bridges in the Middle Ages? Were they still the same? 3. What countries in the Middle Ages and the Renaissance were first to develop bridge building? After the fall of the Roman Empire, progress in European bridge building slowed considerably until the Renaissance. Fine bridges sporadically appeared, however. Medieval bridges are particularly noted for the ogival, or pointed arch. With the pointed arch the ten­dency to sag at the crown is less dangerous, and there is less horizontal thrust at the abutments. Medieval bridges served many purposes. Chapels and shops were commonly built on them, and many were fortified with towers and ramparts. Some featured a drawbridge, a medieval innovation. The most famous bridge of that age was Old London Bridge, begun in the late 12th century under the direction of a priest, Peter of Colechurch, and completed in 1209, four years after his death. London Bridge was designed to have 19 pointed arches, each with a 24-foot span and resting on piers 20 feet wide. There were obstructions encountered in building the cofferdams, however, so that the arch spans eventually varied from 15 to 34 feet. The uneven quality of construction resulted in a frequent need for repair, but the bridge held a large jumble of houses and shops and survived more than 600 years before being replaced. A more elegant bridge of the period was the Saint-Benezet Bridge at Avignon, Fr. Begun in 1177, part of it still stands today. Another medieval bridge of note is Monnow Bridge in Wales, which featured three separate ribs of stone under the arches. Rib construction reduced the quantity of material needed for the rest of the arch and lightened the load on the foundations. During the Renaissance, the Italian architect Andrea Palladio took the principle of the truss, which previously had been used for roof supports, and designed several successful wooden bridges with spans up to 100 feet. Longer bridges, however, were still made of stone. Another Italian designer, Bartolommeo Ammannati, adapted the medieval ogival arch by concealing the angle at the crown and by starting the curves of the arches vertically in their springings from the piers. This elliptical shape of arch, in which the rise-to-span ratio was as low as 1:7, became known as basket-handled and has been adopted widely since. Ammannati's elegant Santa Trinita Bridge (1569) in Florence, with two elliptical arches, carried pedestrians and later automobiles until it was destroyed during World War II; it was afterward rebuilt with many of the original materials recovered from the riverbed. Yet another Italian, Antonio da Ponte, designed the Rialto Bridge (1591) in Venice, an ornate arch made of two segments with a span of 89 feet and a rise of 21 feet. Antonio overcame the problem of soft, wet soil by having 6,000 timber piles driven straight down under each of the two abutments, upon which the masonry was placed in such a way that the bed joints of the stones were perpendicular to the line of thrust of the arch. This innovation of angling stone or concrete to the line of thrust has been continued into the present. 1. What are medieval bridges noted for? 2. What are the advantages of a pointed arch? 3. There were many purposes of medieval bridges. What were they? 4. What was interesting about Monnow Bridge (in Wales) construction? What was rib construction necessary for? 5. What is a basket-handled arch? What is it for? 6. While building the Rialto Bridge Antonio da Ponte faced a problem. What was it? How was it overcome? They have projecting piers, triangular in shape, known as cutwaters. These are found on the upper side with the point towards the stream their purpose being to protect the pier from the force of the current and from the impact of trees and other objects borne along by the water. The spans varied from five feet in the case of small bridges to twenty feet or more in a few cases. The first were semicircular with a barrel vault. In the 13th century pointed arches replaced these arches and groined vaults replaced barrel vaults. Here the main weight was taken on ribs of stone. Many medieval bridges are humped, especially where the roadway rose over pointed Gothic arches. The gradually flattening of the Gothic arch had the effect of reducing the hump and a somewhat flatter roadway appears in the 15th century. Often a medieval bridge is extremely long and included a long stone causeway which leads up to it across a flood plain. This is pierced by subsidiary arches which do not regularly have channels of water flowing through them. They are used, however, at times of flood to allow the swollen waters to escape away, instead of ponding up behind the bridge. Further structures connected with bridges include chapels built for bridge hermits. Gateways and drawbridges were also found. 1. What types of bridges were developed in the 18th-19th centuries? 2. In what way did Industrial Revolution influenced bridge building? 3. What were the main purposes of bridges in the 18th-19th centuries? By the middle of the 18th century, bridge building in masonry reached its zenith. Jean-Rodolphe Perronet, builder of some of the finest bridges of his day (Pont de Neuilly (1774), Pont Sainte-Maxence (1785), Pont de la Concorde (1791)), developed very flat arches supported on slender piers. In London the young Swiss engineer Charles Labelye evolved a novel and ingenious method of sinking the foundations, employing huge timber caissons that were filled with masonry after they had been floated into position for each pier. The 12 semicircular arches of Portland stone, rising in a graceful camber over the river, set a high standard of engineering and architectural achievement for the next generation and stood for a hundred years. Also in London, John Rennie built the first Waterloo Bridge with level-topped masonry arches. In the 18th century, designs with timber, especially trusses, reached new span lengths. In 1755 a Swiss builder, Hans Grubenmann, used trusses to support a covered timber bridge with spans of 171 and 193 feet over the Rhine at Schaffhausen. One of the best long-span truss designs was developed by Theodore Burr, of Tonington, Conn., and based on a drawing by Palladio; a truss strengthened by an arch, it set a new pattern for covered bridges in the United States. Burr's McCall's Ferry Bridge (1815; on the Susquehanna River near Lancaster, Pa.) had a record-breaking span of 360 feet. Another successful design was the "lattice truss," patented by Ithiel Town in 1820, in which top and bottom chords were made of horizontal timbers connected by a network of diagonal planks. Early trusses were built without precise knowledge of how the loads are carried by each part of the truss. The first engineer to analyze correctly the stresses in a truss was Squire Whipple, an American who published his theories in 1869. Understanding precisely how loads were carried led to a reduction in materials, which by then were shifting from wood and stone to iron and steel. During the Industrial Revolution the timber and masonry tradition was eclipsed by the use of iron, which was stronger than stone and usually less costly. The first bridge built solely of iron spanned the River Severn near Coalbrookdale, Eng. Designed by Thomas Pritchard and built in 1779 by Abraham Darby. the Coalbrookdale Bridge, constructed of cast-iron pieces, is a ribbed arch whose nearly semicircular 100-foot span imitates stone construction by exploiting the strength of cast iron in compression. Iron bridges were judged to be technically the best of their time. The use of relatively economical wrought iron freed up the imaginations of designers, and one of the first results was Telford's use of chain suspension cables to carry loads by tension. His eyebar cables consisted of wrought-iron bars of 20 to 30 feet with holes at each end. Each eye matched the eye on another bar, and the two were linked by iron pins. The first of these major chain-suspension bridges and the finest of its day was Telford's bridge over the Menai Strait in northwestern Wales. At the time of its completion in 1826, its 580-foot span was the world's longest. In 1893 its timber deck was replaced with a steel deck, and in 1940 steel chains replaced the corroded wrought-iron ones. The bridge is still in service today. The rise of the locomotive as a mode of transportation during the 19th century spurred the de­sign of new bridges and bridge forms strong enough to handle both the increased weight and the dynamic loads of trains. The most significant of these early railway bridges was Robert Stephenson's Britannia Bridge, also over the Menai Straits. Completed in 1850, Stephenson's design was the first to employ the hollow box girder. The hollow box gave the deck the extra stiffness of a truss, but it was easier to build and required less engineering precision— at the cost, however, of extra material. The wrought-iron boxes through which the trains ran were originally to be carried by chain suspension cables, but, during the building, extensive theoretical work and testing indicated that the cables were not needed; thus the towers stand strangely useless. Among the most important railway bridges of the latter 19th century were those of Gustave Eiffel. Between 1867 and 1869 Eiffel constructed four viaducts of trussed-girder design along the rail line between Gannat and Commentry, west of Vichy in France. The most striking of these, at Rouzat, features wrought-iron towers that for the first time visibly reflect the need for lateral stiffness to counter the influence of horizontal wind loads. Lateral stiffness is achieved by curving the towers out at the base where they meet the masonry foundations ( Eiffel's famous Parisian tower of 1889). Niagara Bridge (USA), whose completion in 1855 vindicated John Roebling's conviction that the suspension bridge would work for railroads, lasted nearly half-a-century before it had to be replaced in 1896. At mid-century, it was the only form capable of uniting the 821ft (250m) gorge in a single span. This half-stereoscopic viewshows the massive stiffening trusses and the wire-cable stays that tied the deck superstructure to the walls of the gorge. In 1855 Roebling completed an 821-foot-span rail­way bridge over the Niagara River in western New York state. Wind loads were not yet understood in any theo­retical sense, but Roebling recognized the practical need to prevent vertical oscillations. He therefore added nu­merous wire stays, which extended like a giant spiderweb in various directions from the deck to the valley below and to the towers above. The Niagara Bridge confounded nearly all the engineering judgment of the day, which held that suspension bridges could not sustain railway traffic. The 1874 Eads Bridge was the first major bridge built entirely of steel, excluding the pier foundations. Designed by James Buchanan Eads, it has three arch spans, of which the two sides are each 502 feet and the middle is 520 feet. The Eads bridge was given added strength by its firm foundations, for which pneumatic caissons, instead of cofferdams, were used for the first time in the United States. Another innovation carried out by Eads, based on a proposal by Telford, was the construction of arches by the cantilevering method. The arches were held up by cables supported by temporary towers above the piers, all of which were removed when the arches became self-supporting. 1. How did the method of sinking the foundations work? 2. What was the reason for making spans longer? 3. Who set a new pattern for covered bridges in the United States? What was it? 4. Why is it necessary to know stresses in trusses? Who was the first to analyze it? 5. How is lateral stiffness achieved? 6. How can you prove that Niagara Bridge confounded nearly all the engineering judgment of the day? 5. tough malleable form of iron suitable for forging or rolling, not cast. 6. a horizontal structure member supporting vertical loads by resisting bending. 7. an assembly of smaller pieces arranged in a gridlike pattern; sometimes used a decorative element or to form a truss of primarily diagonal members. 8. the top surface of a bridge which carries the traffic. 9. a structural member which projects beyond a supporting column or wall and is counterbalanced and/or supported at only one end. Bridge building (for, in, with, by) masonry, arches supported (on, with, through, in) slender piers, the construction (on, with, by, of) arches ( as, in, with, by) the cantilevering method, a viaduct (in, by, of, across) trussed-girder design (along, according to, with, on) the rail line, timber deck was replaced (into, by, with, instead of) a steel deck, the strength (in, of, off, by) cast iron (in, with, on, through) compression, horizontal timbers connected (with, by, in, without) a network (of, with, across, in) diagonal planks. What parts does a bridge consist of? There are six basic bridge forms: the beam, the truss, the arch, the suspension, the cantilever, and the cable-stay. Figure 11 illustrates these forms and indicates the way loads are carried by showing the approximate location of compression (where material is squeezed together) and tension (where material is stretched). Beam. The beam bridge is the most common bridge form. A beam carries vertical loads by bending. As the beam bridge bends, it undergoes horizontal compression on the top. At the same time, the bottom of the beam is subjected to horizontal tension. The supports carry the loads from the beam by compression vertically to the foundations. When a bridge is made up of beams spanning between only two supports, it is called a simply supported beam bridge. If two or more beams are joined rigidly together over supports, the bridge becomes continuous. Truss. A single-span truss bridge is like a simply supported beam because it carries vertical loads by bending. Bending leads to compression in the top chords (or horizontal members), tension in the bottom chords, and either tension or compression in the vertical and diagonal members, depending on their orientation. Trusses are popular because they use a relatively small amount of material to carry relatively large loads. Arch. The arch bridge carries loads primarily by compression, which exerts on the foundation both vertical and horizontal forces. Arch foundations must therefore pre­vent both vertical settling and horizontal sliding. In spite of the more complicated foundation design, the structure itself normally requires less material than a beam bridge of the same span. Suspension. A suspension bridge carries vertical loads through curved cables in tension. These loads are transferred both to the towers, which carry them by vertical compression to the ground, and to the anchorages, which must resist the inward and sometimes vertical pull of the cables. The suspension bridge can be viewed as an upside-down arch in tension with only the towers in compression. Because the deck is hung in the air, care must be taken to ensure that it does not move excessively under loading. The deck therefore must be either heavy or stiff or both. Cantilever.A beam is said to be cantilevered when it projects outward, supported only at one end. A cantilever bridge is generally made with three spans, of which the outer spans are both anchored down at the shore and cantilever out over the channel to be crossed. The central span rests on the cantilevered arms extending from the outer spans; it carries vertical loads like in the supported beam or a truss -that is, by tension forces in the lower chords and compression in the upper chords. The cantilevers carry their loads by tension in the upper chords and compression in the lower ones. Inner towers carry those forces by compression to the foundation, and outer towers carry the forces by tension to the far foundations. Cable-stay.Cable-stayed bridges carry the vertical main-span loads by nearly straight diagonal cables in tension. The towers transfer the cable forces to the foundations through vertical compression. The tensile forces in the cables also put the deck into horizontal compression. 1. There are four basic forms: the beam, the arch, the truss and the suspension. 2. A beam carries horizontal loads by bending. 3. The bottom of the beam is subjected to vertical tension. 4. If two or more beams are joined rigidly together over supports, the bridge is called a simply supported beam bridge. 5. A single – span truss bridge carries vertical loads by bending. 6. Trusses are popular because they use a great amount of material to carry large loads. 7. The arch bridge requires more material than a beam bridge of the same span as it has the more complicated foundation design. 8. The deck of the suspension bridge must be either heavy or stiff or both. 9. A cantilever bridge is generally made with two spans. 10. The tensile forces in the cables also put the deck into horizontal compression. 1. What are basic bridge forms? 2. What loads does a beam carry by bending? 3. What is the bottom of the beam subject to? 4. When is a bridge called a simply supported beam bridge? 5. When does the bridge become continuous? 6. Why are trusses popular? 7. How does the arch bridge carry loads? 8. What parts of the suspension bridge are subject to compression? 9. Where does the central span rest in a cantilever bridge? 1. A support on which something is suspended. 2. A large projecting bracket or beam that is supported at one end only. 3. A large long piece of timber ready for use in building or any of the main horizontal supports of a building. 4. A framework of beams or other supports usually connected in a series of triangles and used to form a support for a bridge. 5. A curved structure capable of bearing the weight of the material above it. 1. Engineers (проектируют) bridges of great length and strength to cross the widest rivers. 2. Arches often (образуют) the tops of doors, windows and gateways. 3. The Romans used the semicircular (арки) in bridges, aqueducts and large-scale architecture. 4. Large (балки) carrying the ends of other beams perpendicular to them are usually called girders. 5. For weight reduction beams of metal are formed as an I or other shape having a thin vertical web and thicker horizontal flanges where most of the (нагрузка) appears. Bridge designs differ in the way they support loads. These loads include the weight of the bridges themselves, the weight of the material used to build the bridges, and the weight and stresses of the vehicles crossing them. There are basically eight common bridge designs: beam, cantilever, arch, truss, suspension, cable stayed, movable, and floating bridges. The types of bridges vary in total length, the length of their spans, and the weight they can support. Before deciding which kind to build at a particular place, engi­neers determine the length of the structure and of each span. They also must consider the maximum load the bridge will carry and the materials available to construct the bridge. Combination bridges may incorporate two or more of the above designs into a bridge. Each design differs in appearance, construction methods and materials used, and overall expense. Some designs are better for long spans. Beam bridges typically span the shortest distances, while suspension and cable-stayed bridges span the greatest distances. Beam bridges represent the simplest of all bridge designs. A beam bridge consists of a rigid horizontal member called a beam that is supported at both ends, either by a natural land structure, such as the banks of a river, or by vertical posts called piers. Beam bridges are the most commonly used bridges in highway construction. Single-piece, rolled-steel beams can support spans of 15 to 30 m (50 to 100 ft). Heavier, reinforced beams and girders are used for longer spans. Girder bridges, which include many highway bridges, are made of beams called girders whose ends simply rest on piers or abutments. These bridges may be used to cross most areas. The span length of girder bridges ranges up to about 1.000 feet (300 meters). There are two main types of girder bridges. In one type, called a box girder bridge, each girder looks like a long box that lies between the piers or abutments. The top surface of the bridge is the roadway. Box girder bridges are built of steel or concrete. In the other type of girder bridge, the end view of each girder looks like an I or a T. Two or more girders support the roadway. This type of bridge is called a plate girder bridge whenmade of steel, a reinforced or prestressed concrete girder bridge when made of concrete, and a wood girder bridge when made of wood. 1. These loads include the weight and the stresses of the vehicles crossing them. 2. The kinds of bridges vary in the length of their spans. 3. It is very important to consider the maximum load the bridge will carry. 4. Each bridge incorporates two or more of the designs into a bridge. 5. Beam bridges typically span the greatest distance. 6. A beam bridge consists of a rigid horizontal member. 7. Beam bridges are rarely used in highway construction. 8. Girders are supported at both ends by natural land structure. 9. The span length of girder bridges ranges up to about 500 metres. 10. There are two types of girder bridges: a box girder bridge and a plate girder bridge. 1. How do bridge designs differ? 2. What do these loads include? 3. What should engineers determine before deciding which kind of bridge to build? 4. What is a combination bridge? 5. What is the difference between beam bridges and suspension bridges? 6. What does a beam bridge consist of? 7. Where are beam bridges most commonly used? 8. What are the two main types of girder bridges? 9. Why is a box girder bridge called so? 10. When is a bridge called a plate girder bridge and when a reinforced? 1. The weight or force supported by a structure or any part of it. 2. Each arch or part of a bridge between piers or supports. 3. A drawing, plan or sketch made to serve as a pattern from which to work. 4. One of the solid supports on which the arch of a bridge rest. 5. A main supporting beam made of steel, concrete or wood. 6. The part of a road used by wheeled vehicles. A bridge is a structure that … horizontally between supports and its function is to carry vertical … .The prototypical bridge is quite simple – two … holding up a beam. The supports must be strong enough … the structure up and the span must be strong enough … loads. Spans are generally made as … as possible; … spans are justified where good foundations are limited. All major bridges are build with the … money. Therefore … that best serves the public interest has a threefold … efficiency, economy, elegance. Truss bridgesare supported by frameworks called trusses. The parts of the trusses are arranged in the form of triangles. Such bridges are built over canyons, rivers, and other areas. A truss bridge may have a main span that extends more than 1,000 feet (300 meters). Each truss consists of steel or wood parts that are connected to form one or more triangles. The simplest truss consists of three parts fastened together at their ends to form a triangle. Most truss bridges have one set of trusses on each side of the roadway. The majority of modern truss bridges have the roadway on top of the trusses and are called deck truss bridges. The roadway of a through truss bridge runs between the trusses. In a simple span truss bridge, each truss extends between two abutments or piers. In a continuous truss bridge, each truss has three or more such supports. Some locations are suitable for either a truss bridge or a girder bridge. In such cases, some engineers choose to build a truss bridge because it requires less construction material than the girder type. However, many engineers prefer a girder bridge because it is more attractive and easier to construct and maintain. Arch bridges are structures in which each span forms an arch. The spans range up to about 1,700 feet (518 meters) long. The arch bridge is one of the oldest types of bridges. Early arch bridges consisted of large stone blocks wedged together to form an arch. Today, the majority of arch bridges that have short spans are made of concrete or wood. Arch bridges with long spans are built of concrete or steel. Engineers must design arch bridges so that the sides of the arch do not spread apart and collapse the bridge. The roadway of some arch bridges lies on top of the arch and is supported by vertical columns called spandrel columns. These columns transfer the load of the roadway to the arch, which bears the weight of the bridge. The roadway of a tied arch bridge is below the curve of the arch. The roadway is supported by girders or other types of beams that hang from the arch. The girders or beams also connect to the ends of the arch to prevent the ends from spreading out. The abutments support the weight of the bridge. 2. A bridge supported wholly or chiefly by trusses. 3. A bridge made of large iron or steel beams for bearing load. 4. A bridge made of curved structures as a support. What functions have had bridges? In addition to providing a passage for traffic, bridges have often had other functions, including service as fortifications and as business districts. The Old London Bridge, for example, which stood from the 13th to the 19th century, was a crowded thoroughfare, full of shops and houses. The original functions of bridges have also been modified for new uses. 1. Truss bridges utilize strong, rigid … that support these bridges over a span. …are created by fastening … together in a … configuration. The truss framework distributes the … of the bridge so that each beam shares a portion of load. Truss bridges can carry heavy loads and are relatively …. They are also … to build. 2. Arch bridges are characterized by their … In an arch, the force of the load is carried … from the top to the ends of the arch, where … keep the arch ends from spreading apart … and … arches are particularly well suited for bridging ravines or chasms with steep, solid walls. Cantilever bridgesconsist of two independent beams called cantilevers thatextend from opposite banks of a waterway. The two cantilevers are joined together above the middle of the waterway by a beam, girder, or truss. Cantilever bridges may have spans as long as about 1,800 feet (549 meters). Each cantilever has two sections, an anchor arm and a cantilever arm. The anchor arm extends between an abutment and a pier. One end of the cantilever arm is supported by the pier, and the other end extends freely over the waterway. The free ends of the two cantilevers are joined together by a suspended span. Most cantilever bridges have two anchor spans and one center span. Each anchor span consists of an anchor arm. The suspended span and the two cantilever arms make up the center span. Научно-технический прогресс и его последствия.